This is a list of films that failed to set the box office on fire, but we just love to watch them over and over when ever they`re on. 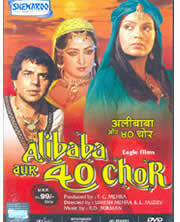 Analysis: An Indo-Russian co-production Ali Baba aur 40 Chor brings to the screen the timeless story of Ali Baba and his gang of thieves. You can never go wrong with a Dharmendra-Hema Malini starrer. I can still recall going to the theatre to see this film, I had just turned five and it was a part of the celebration. It will always be a special film. Analysis: Hrithik Roshan and Amisha Patel's second outing proved to be a disaster at the box office. I still remember watching it in the theatre and liking most of it. What disappointed is the last 30 minutes of the film which dragged on forever, otherwise it's a nice attempt. Analysis: A superb failure at the box office - this film is worth watching for the dual role Shah Rukh Khan plays and Juhi Chawala`s comic timing. Surprisingly, SRK`s dual role in this film is better than in Farhan Akhtar`s DON remake. Analysis: It`s sad but the only reason this film wasn`t a blockbuster is because it was made with newcomers. Not exactly a remake of Padosan but Nayee Padosan does present comedy in a new way, with a dynamic dual role by Rahul Bhatt and good supporting performances this film sure holds your attention till the end. Analysis: Aamir and Salman Khan together for the first time, Crime Master Gogo, not to mention a hilarious screenplay, this is certainly one of the most fun films to watch. It`s hard to believe it wasn`t very successful at the box office, but it has touched many more hearts since. And a couple of catchy songs never hurt a film. Analysis: I have seen the DVD of this film in more homes than people would like to admit. I guess perhaps being a remake of so many films is what attracts people to this one. Analysis: From a James Bond style villain to the latest technology and flesh eating sharks this film has it all. Of course who can forget two of the most popular songs to come out of Indian Cinema - Yamma Yamma and Jaanu Meri jaan. Analysis: Although most people love this film today, it was hardly a money maker when it first released in 1975. But solid performances, catchy dialogue and unforegettable comic timing have made this one of the most beloved comedies in film history. Analysis: I know, most of you just said "What the..." upon seeing this one on the list, but with dialogues like "Jo mard hota hai, use dard nahi hota", "Sabhi goron ka dil kaala nahi hota" and "Peeth Par Maara Hai Ab Seene Par Khaogey", one can't stop themselves from watching this flick. Analysis: It is considered a must watch today, but when Kaagaz Ke Phool first released it performed so poorly at the box office that it cost the Indian Film Industry one of it's greatest directors. Hurt by the miniscule response to his magnum opus Guru Dutt never directed again. andaz apna apna, mard and kagaz ke phool are truely cult movies... Surprised hw these cn flop! In reply to Anonymous (July 20, 2012 9:20 PM). It happens sometimes. Some movies don't find an audience even though they are very good. A prime example is the Hollywood film "It's A Wonderful Life" it was a major box office flop, but it found an audience on television decades later and is now considered a classic. Same thing is true for Andaz Apna Apna, Mard and Kagaz Ke Phool. Guru Dutt was so disappointed after the poor showing of Kagaz Ke Phool that he never directed a film again. Thank you for your comments. Anand and A Wednesday are great films, no argument there, but they are not cult films. A cult film is one which becomes popular after the theatrical release and usually have a short theatrical run. Anand and A Wednesday were box office successes and thus don't fall into the cult category. All the films on this list were box office disasters, but became popular once they were shown on TV - some for their dialogue, some for acting, some for story, etc. etc. It's hard to understand why they have a cult following but people just love to watch them again and again whenever they're on TV, sometimes just to make fun of them. I certainly don't watch Mard because it's a great film, I watch it because the dialogues are a riot... "MARD KO DARD NAHI HOTA"... hilarious! Did Bollywood Kill The "Musicals" Genre?